Two top Afghan government security officials in Kandahar Province, Afghanistan, were killed and the governor of Kandahar was wounded in an attack Thursday by a man wearing an Afghan military uniform. Two Americans were also wounded in the attack that occurred in the governor's compound in Afghanistan's second-largest city. 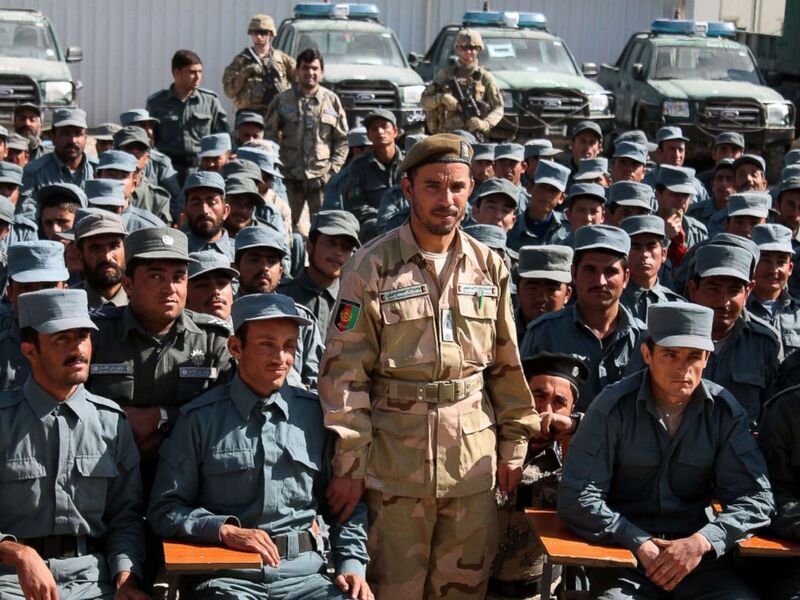 In this Feb. 19, 2017 file photo, Afghan General Abdul Raziq, police chief of Kandahar, poses for a picture during a graduation ceremony at a police training center in Kandahar province. Add Afghanistan as an interest to stay up to date on the latest Afghanistan news, video, and analysis from ABC News. 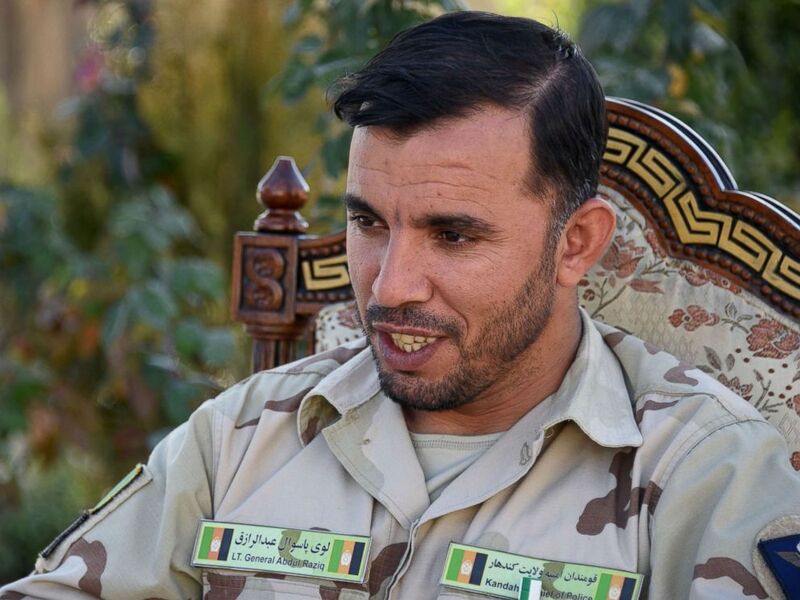 Killed in the attack on Thursday was Lt. Gen. Abdul Raziq, the well-known police chief in Kandahar, and its intelligence chief, Abdul Mohmin. 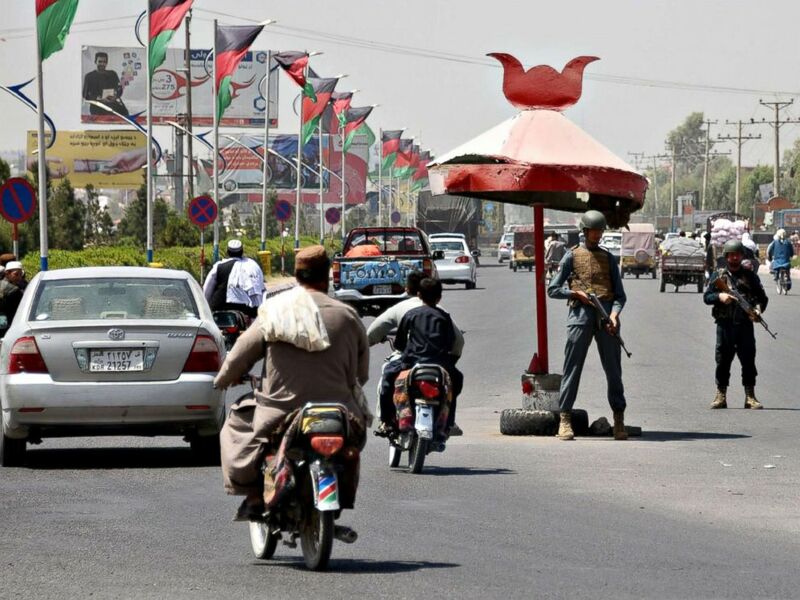 Kandahar Province is in the south of the country, bordering Pakistan. Kandahar's governor, Zalmai Wessa, was wounded in the attack and is receiving treatment at a NATO coalition medical facility, said a spokesman for Resolute Support, the name of the NATO-led training mission in Afghanistan. Earlier there had been conflicting reports that Wessa had been killed in the attack. Two Americans were also wounded in the crossfire, a military service member and a civilian. A third person, a contractor who is not American, was also wounded. They were medically evacuated and are reported to be in stable condition. In this file photo from Jan. 2, 2018, Afghan General Abdul Raziq, police chief of Kandahar, speaks during a press conference in Kandahar province in Afghanistan. The attack at the governor's compound in Kandahar occurred shortly after a meeting there attended by the top U.S. and North Atlantic Treaty Organization (NATO) commander in Afghanistan, Gen. Austin Scott Miller. A Resolute Support spokesman said the attack occurred in an outside area of the compound as the participants in the meeting were dispersing. Miller was on his way to his helicopter when the attack occurred and was uninjured in the incident. The Taliban, which claimed responsibility for the incident, said Miller had been a target. But the head of Afghanistan's army, Gen. Mohammad Yaftali, said at a news conference that the target was the police chief, Raziq. U.S. officials also discounted that claim, describing the attack as directed towards Afghan officials. Afghan policemen stand guard at a checkpoint ahead of parliamentary election in Kandahar on Oct. 18, 2018. "There was a situation at the Kandahar palace today," said Col. David Butler, spokesman for U.S. Forces Afghanistan "Initial reports indicate Afghan officials were the targets." "Initial reports also say the attacker is dead," said Butler. Defense Secretary Jim Mattis commented on Raziq's death from Singapore Friday, where he was meeting with officials from Japan and South Korea. "It's the loss of a patriot," Mattis said. "But we remain absolutely committed to an Afghan-led Afghan reconciliation. We need to find who has done this. But right now it's a -- we are going toward the election and we will continue to defend the Afghan people." In a tweet Miller praised Lt. Gen. Raziq saying "Today I lost a great friend." "We had served together for many years," said Miller. "Afghanistan lost a patriot, my condolences to the people of Afghanistan. The good he did for Afghanistan and the Afghan people cannot be undone." Though it appears the attack was directed at the Afghan officials, it is the closest that the top U.S. military commander in Afghanistan has come to being being a potential target in an insider attack. That is the term used to describe attacks carried out by Afghan security forces targeting U.S. or NATO security personnel. In 2014, Maj. Gen. Harold Greene, who was in charge of part of the training mission in Afghanistan, was killed in an insider attack carried out by an Afghan soldier. He is the highest-ranking U.S. military officer to have died in Afghanistan.